I hit the road at 3:30 on Wednesday morning hoping to key in on some jumbo perch. To target these fish, I was running a drop shot rig with a 3/4 ounce casting weight on bottom and two size 4 hooks tied in above connected by three-way swivels. 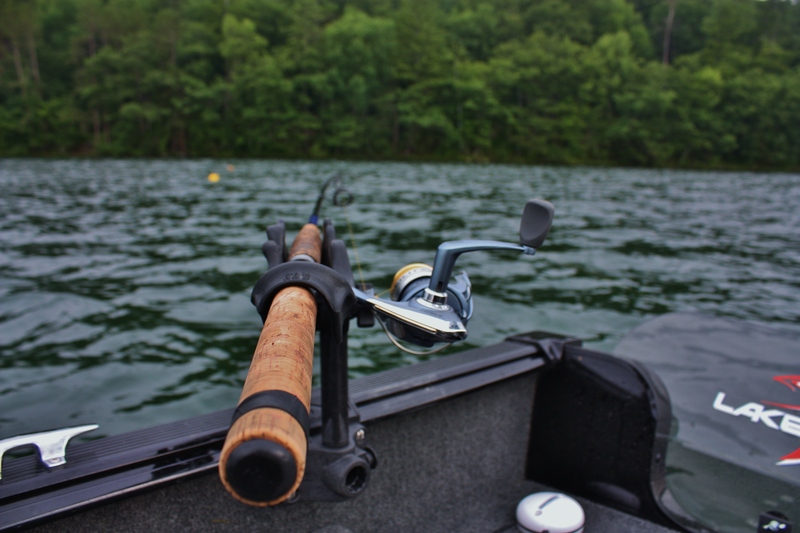 The length of the lead on the hooks ranges from 2-8″ depending on how aggressive the fish are feeding. Finding these fish is usually the biggest time consumer of the day but once you find them you might as well have struck gold! Looking in water ranging from 20-35′ takes time and having side imaging is a must. This morning it took me about 35 minutes to find fish but the school I found was thick. Conservatively, I would estimate several hundred fish. 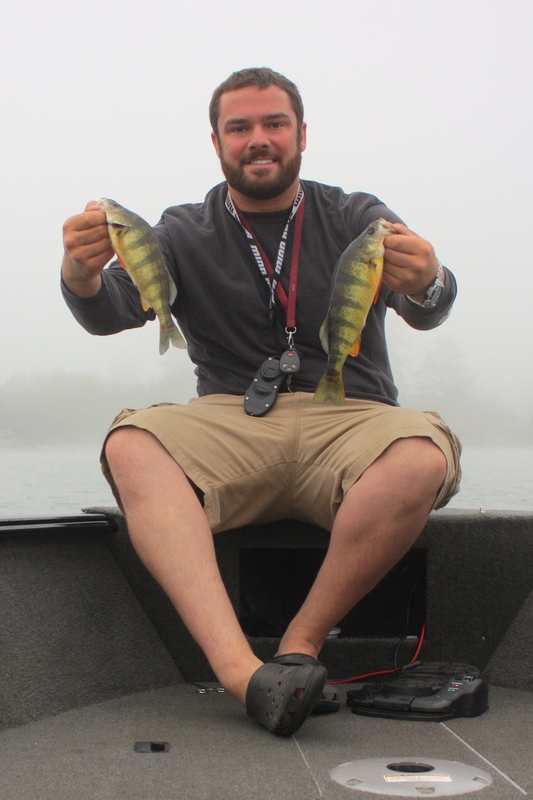 In two passes, I pulled a dozen perch out of 31′ of water before they scattered. From there I was on my own. Working the 28′ contour I trolled around the lake at about 0.6 mph picking fish randomly with no rhyme or reason. Towards the end of the morning, I located a large school of fish holding on a ski course anchor system in 27 FOW. After a few casts I was able to hook the first fish which turned out to be a 9″ bluegill. Over the next 45 minutes I caught a bluegill on just about every cast until they moved on. Before leaving, I figured I should check one more time to see if I could get back on the school that I found first thing in the morning. I was unable to do so but found some fish holding in a 15′ weed bed. 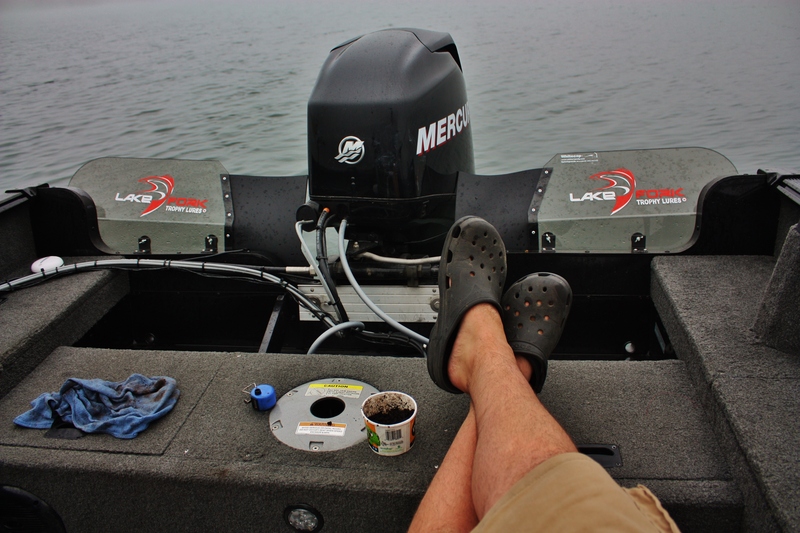 As I keyed in on them, a storm rolled in pushing me off the water.